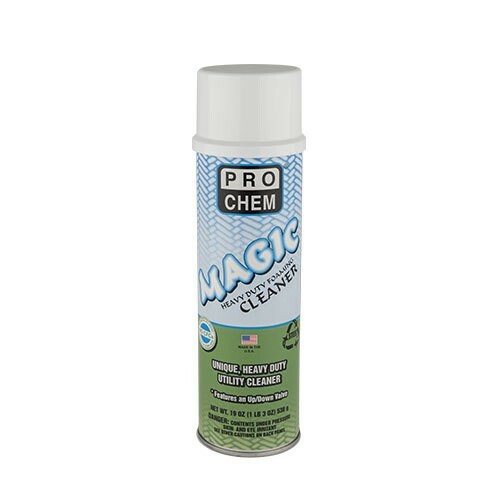 MAGIC | Pro Chem, Inc. Originally developed for the textile industry, MAGIC is a versatile foaming cleaner that contains special grease-cutting additives and detergents that will remove heavy accumulations of grease and grime wherever they are found. The thick foam clings to vertical surfaces, preventing drips and runs and ensuring prolonged contact cleaning time. It can be safely used on stainless steel, ferrous metals and rubber. Ideal for use on heavily soiled areas and places they may occur. Shake well before using. Spray either on rag or directly onto surface and wipe clean. For those difficult-to-remove stains, allow foam to remain on surface for several minutes before wiping off. Rinse if desired. Note: Do not use on glass. IMPORTANT: When using on plastic seat covers or plastic tile, RINSE with clean, damp cloth.